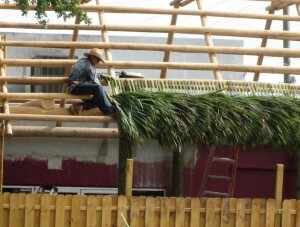 Home > Discussions > Have You Ever Seen a Thatched Roof Being Built? The other day I was driving home through an area of shops and restaurants and I passed by something I’ve never seen before – a thatched roof being created. With the framework in place, this man was either stacking several palm fronds together or maybe rolling several together…it was tough to tell from where I parked. but, it was fascinating to see him work so quickly. Someone on the ground would pass the fronds up to him, he would work with them to make them”roof worthy” and then just attach them to the framework. I drove by later that same day and the thatched roof was beautiful in it’s green state. A drive by a couple days later and the roof was the color you would expect, a dry beige-gray with just a hint of green that by now is no longer there. It was an interesting process to watch and I just thought I’d share it with you.